Family owned and locally managed BAC Community Bank is pleased to announce that Sweeny Youmaran has joined the Bank as Relationship Manager. Youmaran has a Communications degree and has worked in the financial services industry for over 8 years. Her managerial experience includes both consumer and business banking, with a focus on consumer lines of credit and small business lending. These strengths will be utilized as Youmaran will be assisting both consumer and small business loan applicants, as well as existing customers. Youmaran will be working primarily from the BAC Community Bank office located at 517 East Weber Avenue in Stockton and can be reached by telephone at (209) 373-2531 or by email at sweeny.youmaran@bankbac.com. Ten laptop computers were donated to the Manteca’s Boys & Girls Club thanks to T.J. Waterford and his wife Monique of REeBroker Realty on Cherry Lane in Manteca. 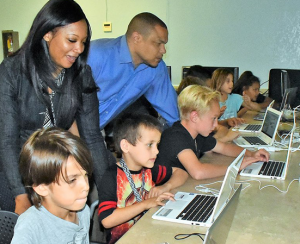 Waterford has funded the computer program through two non-profit organizations and his REeBroker Real Estate firm in Manteca through proceeds from his real estate sales. He said learning computer concepts early on in life through the Boys & Girls Club is about elevating a youngster and making sure they will be successful in life and have the potential to earn robust salaries after they graduate from college. Katy Winders was named the new Director of the Valley Sierra Small Business Development Center. Winders started at the VSSBDC in 2015 as the organization’s Assistant Director. Her predecessor, Kurt Clark, served as VSSBDC’s Director for 15 years but was recently selected as the Regional SBDC Director for Central California. In 2017, Winders was named the top SBDC professional in Central California. Winders’ new position is effective immediately. Hosted by Opportunity Stanislaus, the VSSBDC promotes the development, growth and success of small businesses and aspiring entrepreneurs throughout Stanislaus, Merced, Tuolumne and Mariposa Counties, thereby enhancing individual, family, community and regional prosperity.